The ASCE 7 standard is not a simple standard to follow and apply to “Real World” situations. Therefore, we have written a EBook to illustrate some common problems that are encountered in structural design. The EBook is purchased online, and if it’s purchased in combination with MecaWind the user receives a discount. To take advantage of this discount, add MecaWind to your shopping cart and then you will see the discounted EBook offered at the bottom of the page. Compares each structure using ASCE 7-10 and ASCE 7-16, and shows the results using both methods. Examples are worked manually, and then using MecaWind, and both results are presented. This gives the user a detailed comparison of the software results and manual calculations. A copy of all MecaWind input files is provided, so that the user can open the file and look at it interactively. Click here to get a preview of the Ebook. How quickly can I get the EBook? You can download it almost immediately after purchasing. Do I need anything special to view the EBook? The EBook is a pdf file that can be viewed with Adobe Reader, which is free at www.adobe.com. 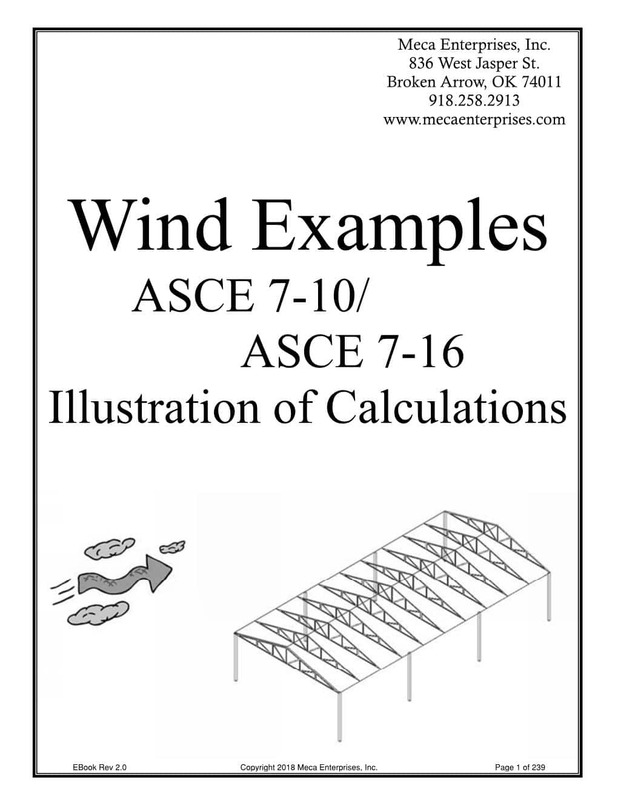 Is the EBook for ASCE 7-05 or ASCE 7-10? Both, the EBook compares the results from both codes so that you can see the differences in the code. How do I purchase the EBook at the discounted price? Add MecaWind to your shopping cart, and then you will see a special discounted offer for the EBook at the bottom of your page.